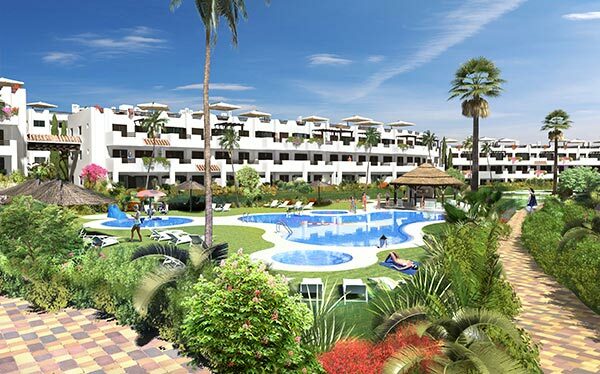 Mar de Pulpí is an extraordinary development located next to the sea in San Juan de los Terreros, Almeria. It is a comprehensive development with a large coastal park of over 70,000 m2 comprising gardens and a seafront promenade plus areas for hotels and catering, shopping and sport. The traditional Mediterranean-style complex with Arabic influences has been designed using low-impact architecture which respects the natural environment and finished in classic bright white of Andalusia. 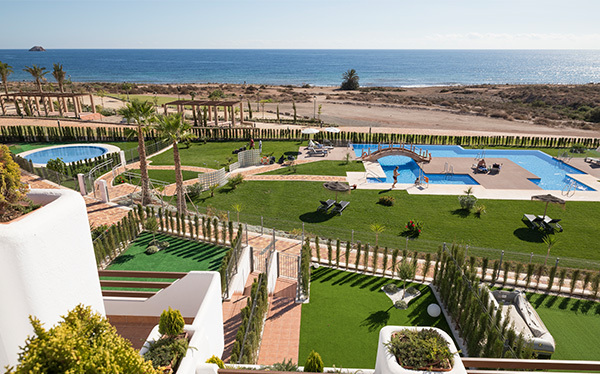 In Mar de Pulpí Los Jazmines, you will find properties right on the seafront with a large heated infinity pool from which to enjoy the magnificent views of the beach and the coastal park located next to the development. It also has another swimming pool inside the development, two swimming pools for children, heated jacuzzis, and Turkish and Finnish saunas. 2 and 3-bedroom properties from €144,000. WANT TO SEE YOUR NEXT HOME? Click here. Mar de Pulpí Las Azucenas is located just 500 metres from the beach and has a bright, spacious feel. It has two large pool areas and a stream crossed by various bridges flanked by leafy vegetation and winding paths which creates an area for walking, pleasure and relaxation. 1, 2 and 3-bedroom properties from €85,000. Las Villas de Mar de Pulpí is the perfect place to enjoy the Mediterranean with the privacy and intimacy that can only be enjoyed from an independent home on private grounds. The spaciousness of your own garden, imposing terrace and optional private swimming pool will create an environment of exclusive tranquillity. 2 and 3-bedroom villas from €255,000.